These heart-shaped tin candles are a perfect way to add ambiance anywhere. Clear openings on brushed tin reveal the vanilla-scented candle inside. Tuck them into your guests&apos; favor bags to inspire warm and lasting memories of your wedding day. They measure 2 1/4" x 1 1/4" x 1" each. 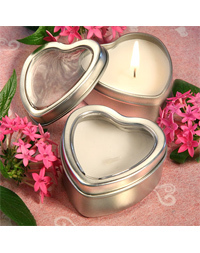 To leave Heart Candle Favor Tin and go to Home Page, click here.